Olivia Mobayed – second year master’s student in City and Regional Planning at UPenn, WTS Sylvia Alston Scholarship recipient, and Mobility21 professor Erick Guerra’s advisee – has spent the semester with SEPTA’s Long Range Planning Department analyzing bicycle access to subway and regional rail stations. 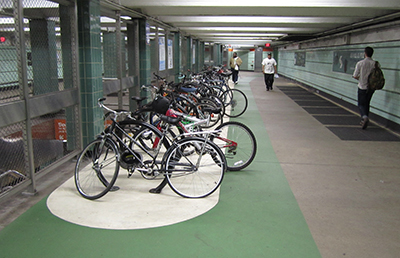 By tracking changes in bike ridership and facility improvements, she has identified the next round of stations to receive upgrades on their bicycle parking facilities. Tasker-Morris Station, pictured here in December, saw a 90% increase in bike ridership to the station in just two years with the installation of mezzanine-level bike parking.